Signet-ring cell carcinoma of the cervix is a subtype of mucinous adenocarcinoma of the cervix. However, this tumor is rare, and metastatic tumors derived from gastric or breast cancers should, therefore, be considered as differential diagnoses. In the present case, the results of imaging, endoscopy, immunohistochemistry, and detection of the human papillomavirus (HPV) genome indicated that the cancer cells originated from the cervix. Notably, no previous reports have described the HPV genome status in primary signet-ring cell carcinoma of the cervix. We herein review this rare case of primary signet-ring cell carcinoma of the cervix with a brief discussion of the literature. An early 40 years of Japanese woman (gravida 0 para 0) underwent routine screening at another institution. She had no relevant medical, smoking-related, or alcohol-related history. Cervical cytology revealed abnormal findings, and the patient was referred to our hospital for further evaluation. On the initial visit, a hard tumor was palpated in the cervix; however, no parametrial invasion was found by pelvic examination. The surface of the tumor was smooth but readily exhibited contact bleeding. The serum tumor marker levels were as follows carcinoembryonic antigen, 1.2 ng/mL; carbohydrate antigen (CA) 19–9, 4.1 U/mL; and CA 125, 42.5 U/mL (slightly elevated). T2-weighted pelvic magnetic resonance imaging showed a 32-mm × 22-mm × 38-mm elevated lesion in the cervix with mild high-signal intensity. Contrast-enhanced computed tomography showed no findings suggestive of distal metastasis or primary lesions in other organs. Upper gastrointestinal endoscopy was repeated along with random gastric mucosal quadrant biopsies, both of which revealed no abnormal findings. Cervical cytology showed atypical glandular cells containing mucin in the cytoplasm and eccentric nuclei, suggesting signet-ring cell carcinoma [Figure 1]a and [Figure 1]b. The cervical histology was consistent with signet-ring cell carcinoma [Figure 1]c. Based on the diagnosis of stage IB1 cervical adenocarcinoma, the patient underwent radical hysterectomy and bilateral adnexectomy [Figure 1]d. By immunohistochemistry, tumor cells were positive for p16 (Roche 1:1 dilution), CA125 (Roche 1:2), CK7 (Leica 1:100), MIB1 (DAKO 1:200), and MUC5AC (Novocastra 1:200) but negative for p53 (Novocastra 1:50), TTF1 (DAKO 1:400), CDX2 (BioGenex 1:100), CK20 (DAKO 1:200), E-cadherin (DAKO 1:200), and beta-catenin (DAKO 1:400) [Figure 2], data not shown]. The mammary neoplasm marker gross cystic disease fluid protein 15 (GCDFP15) (Covance 1:100) and the gastrointestinal neoplasm markers MUC2 (Novocastra 1:200), MUC6 (Novocastra 1:200), and CDX2 were all negative (data not shown). HPV genotyping assays were performed using exfoliated cervical cells and formalin-fixed paraffin-embedded (FFPE) tumor tissues by polymerase chain reaction (PCR) with PGMY primers and modified general primers, respectively,, demonstrating HPV16 positivity in both specimens. The full HPV16 genome was successfully amplified by long-range PCR from the exfoliated cervical cells, and the whole-genome sequence of HPV16 (GenBank accession number LC193821) was determined by deep sequencing on a MiSeq sequencer (Illumina, San Diego, CA) with the MiSeq Reagent Kit v3 (150 cycles) (Illumina). The full-genome sequence of HPV16 was reconstructed from the total read sequences using the VirusTAP pipeline. The case was finally diagnosed as cervical cancer, the International Federation of Gynecology and Obstetrics stage IB1, mucinous carcinoma, signet-ring cell type (WHO classification, 2014). Three cycles of a combination of paclitaxel and cisplatin were administered postoperatively. At the time of this writing (33 months postoperatively), the patient had developed no recurrence. This study protocol was approved by the Institutional Ethics Committee, and written informed consent was obtained from the patient. Cervical adenocarcinoma is classified as mucinous, endometrioid, serous, or clear cell. Cervical signet-ring cell carcinoma is a subtype of cervical mucinous carcinoma and is very rare. Moreover, most cases of cervical signet-ring cell carcinoma are assumed to be metastases from gastric, colorectal, or breast cancer. In the present case, the immunohistochemical staining pattern for keratin markers (i.e., CK7+ and CK20−) differed from that of colorectal cancer, rather suggesting breast cancer. As the representative mammary neoplasm markers, GCDFP15 or GATA3 is well-known. GATA3 is a more sensitive marker than GCDFP15 for breast cancer; however, it is reportedly positive in the presence of metastatic bladder cancer., The GCDFP is also expressed in adnexal, vulvar, and lung carcinomas. There was no gold standard specific mammary neoplasm markers. We then used one of the mammary neoplasm markers: GCDFP15, which was negative. The gastric cancer markers MUC2, MUC6, and CDX2 were all negative. HPV infection contributes to the onset of cervical cancer. In general, the HPV genome is not detected in mammary or gastric cancer cells. HPV infection contributes to the onset and progression of cervical cancer. To date, only the HPV18 genome has been identified in cases of primary signet-ring cell cervical carcinoma in four publications.,,, In the present case, we performed PCR with different sources of materials, such as exfoliated cervical cells before surgery and FFPE tissue from the surgical specimen. Theoretically, FFPE tissue specimens are a more reliable source of cancer cells for determining causative HPV genotypes because these tissues contain small pathologically confirmed lesions. However, the recovery rate of DNA from FFPE tissue specimens is generally much lower than that from exfoliated cervical cells, and formalin fixation introduces DNA cross-linking and fragmentation. For confirmation, we performed PCR assays with both specimens. In the present case, both samples tested positive for HPV16, suggesting that the cancer cells indeed contained the HPV16 genome. To the best of our knowledge, HPV16 has not been detected in any of the earlier reported cases; thus, we believe that the present case is rare and unique. Strikingly, the presence of the intact HPV16 genome was demonstrated by next-generation sequencing. Further analysis by deep sequencing techniques is needed to elucidate the mechanism of cervical cancer development. The treatment and prognosis of primary signet-ring cell carcinoma of the cervix remain largely unclear; according to previous reports, the prognosis is not always favorable. Therefore, we believe that the accumulation of more cases will help to determine the diagnosis and optimal treatment options for this disease. We have herein reported the first case of primary signet-ring cell carcinoma of the cervix containing the full HPV16 genome. Additional case reports should be accumulated in the future. We would like to thank Ms. Saito, Department of Obstetrics and Gynecology, Keio University, School of Medicine for preparing the material, Prof. Kuroda and Dr. Tsukamoto, Department of Pathology, Fujita Health University, School of Medicine for critical discussion. Söderlund-Strand A, Carlson J, Dillner J. Modified general primer PCR system for sensitive detection of multiple types of oncogenic human papillomavirus. J Clin Microbiol 2009;47:541-6. Azuma Y, Kusumoto-Matsuo R, Takeuchi F, Uenoyama A, Kondo K, Tsunoda H, et al. Human papillomavirus genotype distribution in cervical intraepithelial neoplasia grade 2/3 and invasive cervical cancer in japanese women. Jpn J Clin Oncol 2014;44:910-7. Yamashita A, Sekizuka T, Kuroda M. VirusTAP: Viral genome-targeted assembly pipeline. Front Microbiol 2016;7:32. Gown AM, Fulton RS, Kandalaft PL. Markers of metastatic carcinoma of breast origin. Histopathology 2016;68:86-95. 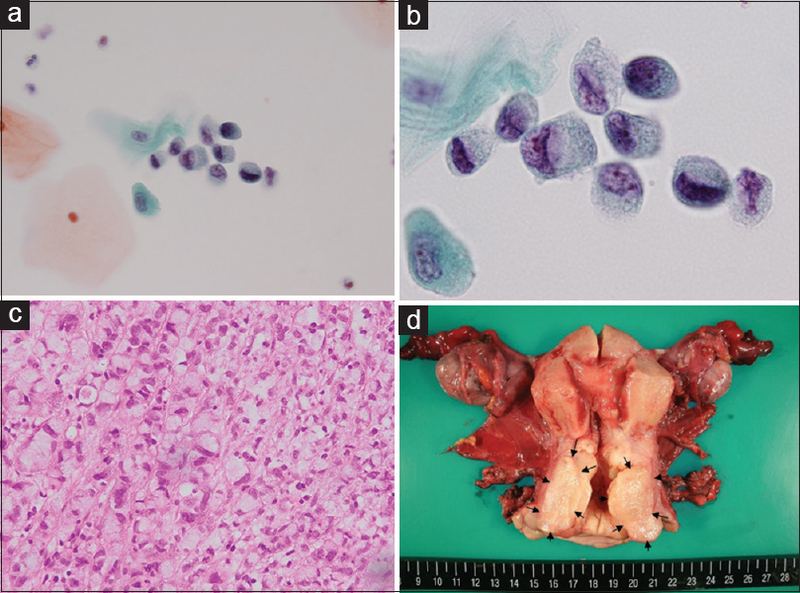 Siddiqui MT, Seydafkan S, Cohen C. GATA3 expression in metastatic urothelial carcinoma in fine needle aspiration cell blocks: A review of 25 cases. Diagn Cytopathol 2014;42:809-15. Giordano G, Pizzi S, Berretta R, D'Adda T. A new case of primary signet-ring cell carcinoma of the cervix with prominent endometrial and myometrial involvement: Immunohistochemical and molecular studies and review of the literature. World J Surg Oncol 2012;10:7. Mayorga M, García-Valtuille A, Fernández F, Val-Bernal JF, Cabrera E. Adenocarcinoma of the uterine cervix with massive signet-ring cell differentiation. Int J Surg Pathol 1997;5:95-100. Insabato L, Simonetti S, De Cecio R, Di Tuoro S, Bifulco G, Di Spiezio Sardo A, et al. Primary signet-ring cell carcinoma of the uterine cervix with long term follow-up: Case report. Eur J Gynaecol Oncol 2007;28:411-4. Kaidar-Person O, Amit A, Berniger A, Ben-Yosef R, Kuten A, Bortnyak-Abdah R, et al. Primary signet-ring cell adenocarcinoma of the uterine cervix: Case report and review of the literature. Eur J Gynaecol Oncol 2013;34:353-4. Castro FA, Koshiol J, Quint W, Wheeler CM, Gillison ML, Vaughan LM, et al. Detection of HPV DNA in paraffin-embedded cervical samples: A comparison of four genotyping methods. BMC Infect Dis 2015;15:544.